Ally is in Grade 2 and her mother is most concerned about her handwriting. 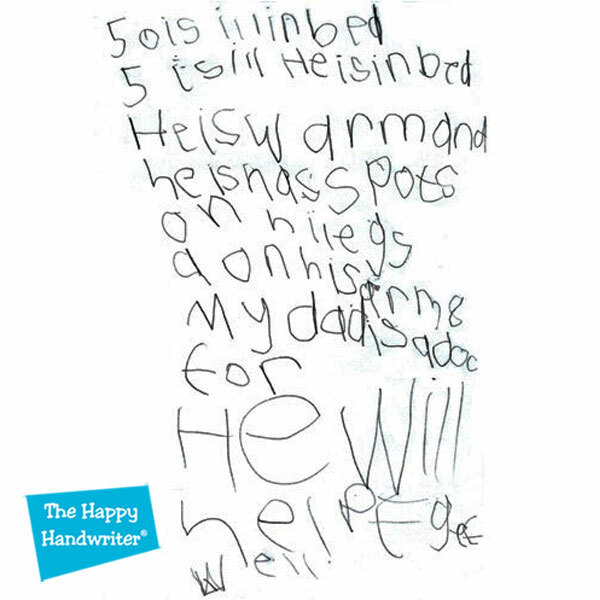 What are some of the clues we can identify from the challenges evident in this handwriting sample, and which handwriting learning activities can help her? Occupational Therapist, Bunty McDougall weighs in. The first thing is always to say that handwriting is a highly complicated and multifaceted skill. The foundations are complex and there are many developmental building blocks that need to be in place for handwriting to work optimally. 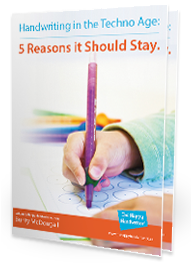 No Handwriting Evaluation is complete without looking at all these aspects, and it is critical that your child is observed during handwriting and other school related tasks. But, there is a lot to be seen from your child’s handwriting in the school setting and I always make sure to take a look at their school books, in addition to my Handwriting Evaluation, as school is the place where this skill is expressed. Ally is in Grade 2 and research has shown that by Grade 2 children spend 30 – 60% of their day involved in fine motor tasks, 85% of which is handwriting. So today, I am just going to look at her handwriting sample and see what I can pick up from that. 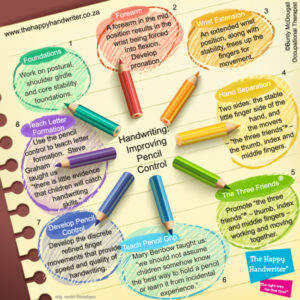 This information would be used in conjunction with information gained from the Handwriting Assessment to establish the root causes of her handwriting difficulties. The first thing I can see is there is a lack of well developed pencil control. Her pencil strokes are wobbly, her letters are not neatly closed off, and she lacks the ability to control the pencil to keep her handwriting a consistent size. The significant fluctuation in size tells me that Ally is sometimes using small refined movements when writing, but often the larger uncontrolled movements that frequently arise from the wrist or even elbow. So apart from wanting to be able to actually watch and see how she holds her pencil and what happens when she writes, I would certainly like her to develop her pencil control. There are very specific muscles and components of movement we need to develop. I have bundled the activities that target exactly these all together, along with a specific Parent Guide, in the Fine Motor Fun kit. We don’t want to make Ally participate in a daily drudge of boring exercises that are soon going to become a battle ground between her and her mother, we want her involved in specifically designed FUN purposeful activities. You see, as I always say, children learn when they are having fun! Then next thing Ally would benefit from is the introduction writing of lines. The external structure provided by the lines can go a long way to provide the framework within which to work, which assists in consolidating the letter sizes. I love speckled lines – alternating dotted and bold lines which assist with letter placement. I would try a few different options – both regular and Irish lines and see what works best for her. And then, letter formation. I can see that Ally doesn’t consistently start her letters in the same place. She is older and in the classroom setting every day so there isn’t always the luxury of going back to the beginning. I would choose the specific letters Ally is struggling with from her handwriting sample, and work on those through a multi-sensory approach. Research has shown when it comes to handwriting, multi-sensory is NOT just for pre-schoolers. Ally needs to build her letters, she needs to experience the sensory benefits of experiencing the formation pattern through the use of The Texture Overlay Board and she needs to practise in the correct formation pattern – lots of times! Hello Rainbow Letters and Numbers! The Grade 1 Handwriting Bundle will enable Ally to benefit from texture, auditory reinforcement, repetition, along with the placement of letters on lines with the speckled lines. It doesn’t matter that this is the Grade 1 Bundle – the principles for addressing her handwriting remain the same. I would encourage Ali’s mother to collect together the handwriting learning activities she needs and then set up an intensive 6 week home programme – 5 times a week for 15 – 20 minutes. (I really only need four but I say 5 for the day that gets forgotten!) I would make Ally tick off each day she works to ensure that she stays on track and would encourage her mother to put an incentive like a family picnic, or a walk on the beach in place for once they reach the end. If Ally follows these guidelines I have every reason to believe we would see positive changes – Ally deserves this opportunity. And she is going to have fun along the way!